This page continues to be under construction... Please be patient as new content is added! What NEEDS Will This Project Address? 1. Overcrowding. The current GHS building was last renovated in the early 1990's. The building was constructed at that time for 750 students with just under 600 students attending. Currently we have 868 students in the building (with 6 portable classrooms). By 2028-2029 the GHS student population is projected to be 975 students. 2. Undersized Instructional Spaces and 21st Century Programmatic Needs. Most classrooms at GHS are currently between 500-717 square feet. Current MDOE guidelines are for classrooms of 800 square feet to meet the needs of our 21st century learners. Additionally, with increasing student populations we are short specific classrooms for specific content areas. For example, we will need a 2nd gym to house almost 1000 students due to the need to operate 3-4 PE classrooms. Another example is that we would need an additional 2 science classrooms in order to meet the needs of almost 1000 students. 3. Safety. Currently our administrative offices are located on the opposite side of the building as the main public entrance. This makes it very difficult to control the safe flow of visitors in and out of our buildings each day. Additionally, we have students traveling outside of the main building to six portable classroom spaces which make controlling access to the building even more difficult. 4. Undersized Cafeteria. Our current seating capacity is 216 students per lunch. We offer 3 lunches which means we can effectively seat 648 students. Our total student population is currently 868 students. 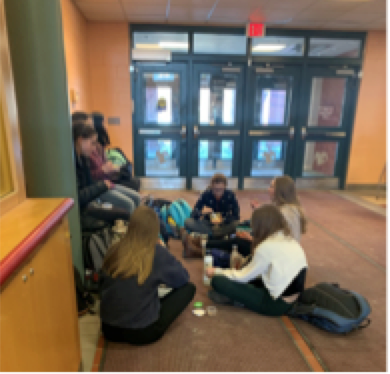 Many of our students currently sit on the floor in the lobby or hallway areas to eat their lunches. This is not sanitary and it is not conducive to learning. 5. Mechanical Systems. Mechanical systems were last upgraded in the early 90's with the last renovation. This was 25+ years ago. Many of our systems either have already or soon will reach the end of their useful life. Our most recent numbers show us that it costs us approximately $1.25/square foot to operate GHS. As a comparison, Great Falls Elementary School costs us $1.03 to operate and the GF building allows for year-round climate control. 6. Inadequate Parking. Currently, we have a total of 278 parking spaces on the GHS campus. With over 100 staff and 868 students, this simply is not enough. MDOE guidelines would allow for a school of our size to have between 400-500 parking spots. The proposal we are currently working with would provide for 473 total parking spaces, an increase of almost 200 spots. 7. Undersized Nursing Clinic. Our current clinic is too small and does not allow for the privacy needed for a clinic to effectively operate. NEASC accreditation has been clear that if we do not address our undersized nursing clinic space for students we will be placed on warning status for our accreditation. 8. Lack of Storage. Because of our over enrollment, we have had to convert storage spaces into classroom spaces and therefore, we do not have adequate storage space. We currently outdoor trailer beds to store items that range from drama productions equipment to track and field equipment and everything in between. 9. Overused and outdated Athletic Fields. GHS currently operates 2.5 competition fields on site. MDOE guidelines would allow for 6-8 grass fields for similar sized high school populations. Our fields are overused and are therefore difficult to maintain in appropriate playing condition. Additionally, our outdoor lighting is outdated. Current lighting is on wooden polls that have twisted and turned over 25+ years to the point that lights may no longer be pointing in the direction they need to be. Some wooden polls had to be removed last year due to rot and pest infestation. Current lighting is not efficient. The GHS Building Committee will be getting a first look at the initial cost estimate for the project in March, 2019. The Building Committee will also be sponsoring a detailed traffic engineering study during the month of March as well. Harriman associates will continue to work with Town officials to ensure that as we sharpen our design, we are meeting all required codes for the project to be approved. We will continue to conduct periodic public forums to seek public feedback. - Feb. 25 - March 8, 2019 - "Thought Exchange" launched to allow for collection of online community feedback. - March 12, 2019 - GHS Building Committee gets first initial cost estimate for project. 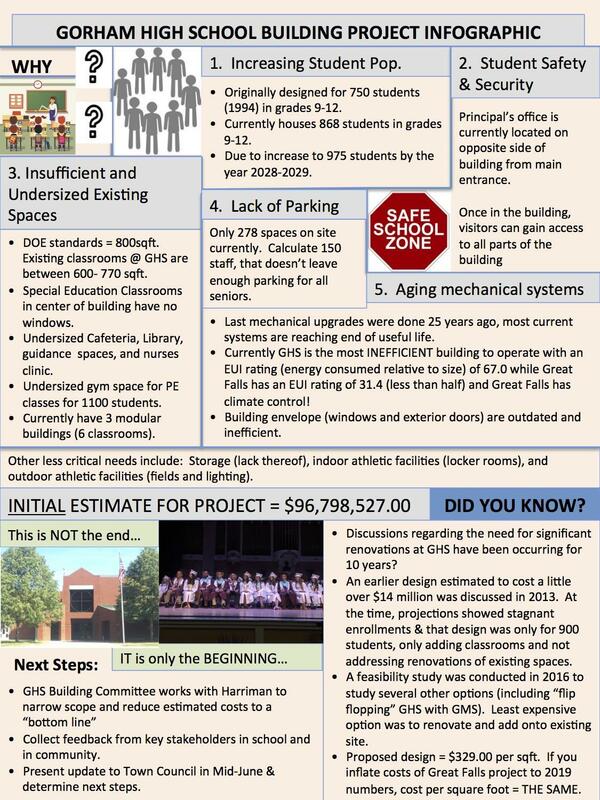 - March 13, 2019 - Presentation to Gorham School Committee of initial project cost estimate. 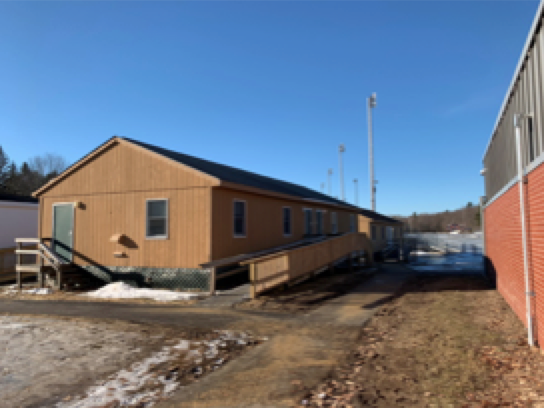 - March 19, 2019 (Tentative date, subject to change) - Presentation to Gorham Town Council of initial project cost estimate. - March 26, 2019 - Public Forum #2, 6:00 p.m. at GHS. - May, 2019 - "Gorham Pride" Capital Campaign launched. - March - July, 2019 - GHS building committee adjusts design based upon public feedback & estimated costs, seeks more feedback, and makes more adjustments until arriving at a final proposal. - July, 2019 - GHS building committee votes to adopt a proposal which will be sent on to School Committee and Town Council for approval. - August, 2019 - Gorham School Committee votes on project proposal. - September, 2019 - Gorham Town Council vote on project proposal and language associated with referendum question(s). - November, 2019 - Public Referendum vote on GHS project proposal.